As promised in my previous coverage of Dial M for Murder, here is a more detailed look at one specific sequence in the film. This is the sequence involving Tony Wendice’s conversation with Swann. This portion of the film corresponds to Act I, Scene ii in Frederick Knott’s original play. In Hitchcock’s movie, it is just over 22 minutes in length, comprising slightly more than 20% of the film’s total running time. So how does Alfred Hitchcock manage to sustain interest and suspense, for such a long period of time, with only 2 actors in one room? There are approximately 121 editorial cuts in this 22 minute sequence, averaging one cut every 11 seconds. This seems like a lot of editing for Alfred Hitchcock, but the specifics are much more interesting than mere mathematics. Of course, there is more to it than just the editing. Of equal importance in this scene is the set design. This is one of the most perfectly designed and decorated sets in any Hitchcock film, and we will see how important that is to the scene. 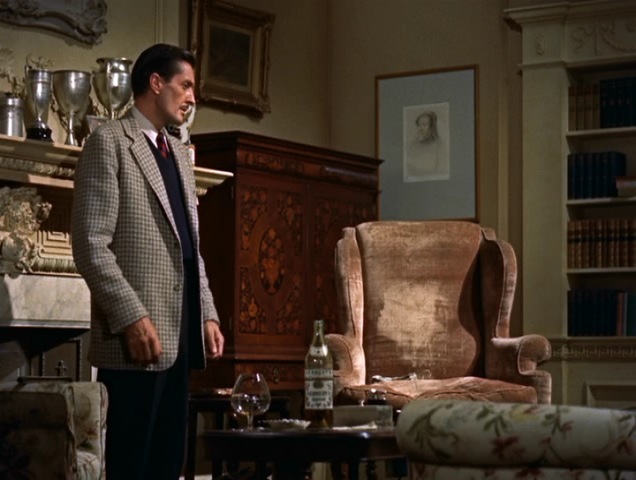 As Wendice joins Swan on the sofa, the camera pans left so that we are behind the sofa, and the actors, with a lamp in between the two. The camera has moved almost 90 degrees clockwise, and rather than cut to the new set-up, we observe the camera movement. This is slightly off-putting. Every time the viewer might start to get complacent, Hitchcock quickly changes the setup, keeping us off guard, and hopefully ensuring that we are paying attention to the very important dialogue. This camera angle puts the viewer in the role of a spy of sorts, peeking over the back of the sofa. After this dramatic camera movement, the scene continues in one uninterrupted take for about a 1 minute and 45 seconds. During this time, Tony Wendice will get up and sit down twice, all without cutting. 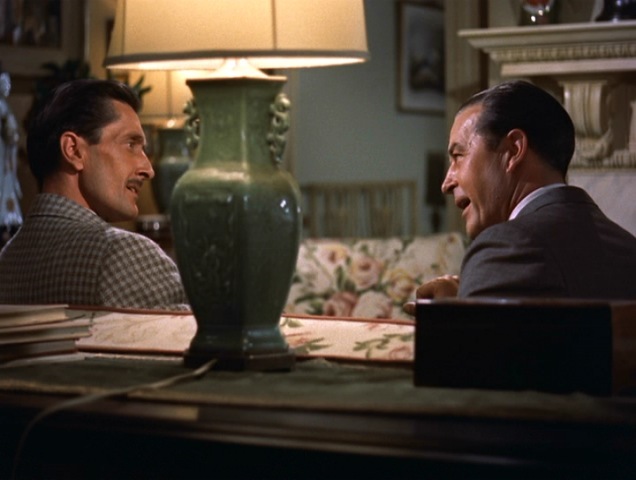 Wendice ends up where he began, opposite Swan, and after an establishing two-shot Hitchcock goes back to the standard “back-and-forth”, cutting between the two men as Wendice slowly reels in Swan. 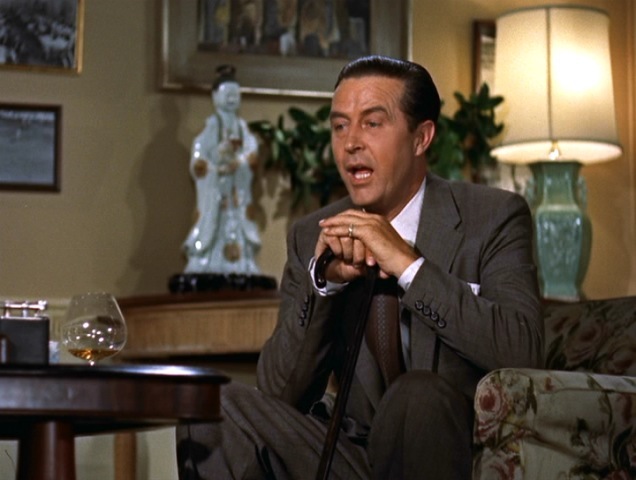 It is worth noting the Japanese porcelain figurine behind Tony Wendice in this photo. The figurine appears in various camera angles, and in a couple of instances appears to be staring directly at the camera, almost as if he is listening in on the conversation. This is not a random choice, in the figurine or its position. It is used as a framing object. (This is not the first time Hitchcock used a figurine as a participant in a scene. In The 39 Steps there is a statue pointing towards an open window, making the viewer aware of trouble to come.) After almost 3 minutes of rather standard back-and-forth cutting, Tony gets up and moves to the desk. Look at him sitting on the edge of the desk, arms crossed, both confident and comfortable. He exudes power. By this time he knows that he has Swan, and he is charming as ever. Now the camera has moved to the opposite side of the room, near the fireplace. Our view has moved 180 degrees from where we were when the two men sat on the sofa together, with the lamp between them. Now the lamp is to the left of the frame, providing counterbalance to the figure of Wendice. Tony Wendice will move back to the other side of the room, sitting now in the deep chair to the right of the one he sat in previously. There behind Tony’s head is a framed work of art, in between two bookshelves. 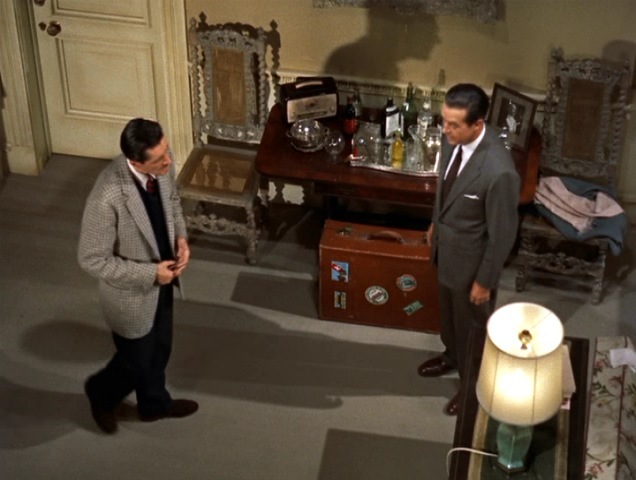 As he walks to the right, we see the second bookshelf, as well as some sort of china cabinet in the corner of the room. 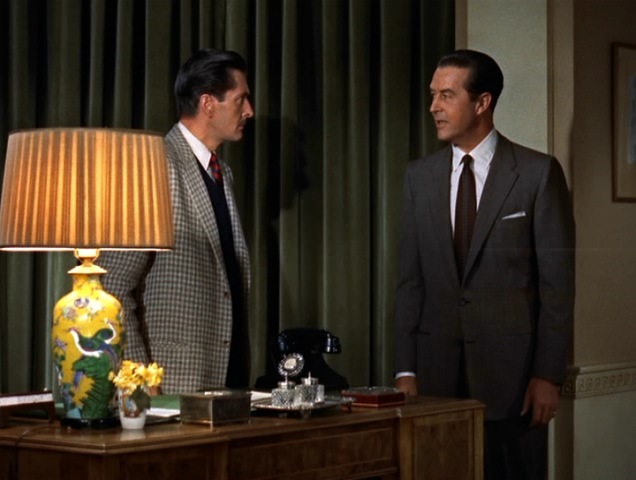 Now we see the smaller, more ornate yellow lamp on the desk. It enters this scene frame right. Just as the Japanese figurine and the green lamp have been important elements of framing before, now the yellow lamp will fill the same role. Tony tosses the money across the room to Swan. This is as far apart physically as they will ever get in this 22 minute sequence. There is a gulf between them, as Swan appears to hesitate. We can now see another ornate piece of furniture, and another art print on the wall. Note also the brandy bottle, perfectly centered in the frame. Alfred Hitchcock has made a complete circuit of the room, in a span of about 15 minutes, showing us every wall, every door, every unique furnishing. Most viewers will make no notice of this, because they will be focused on the dialogue between Wendice and Swan, but it is the constantly changing camera angles, and decor, that enhance the dialogue. 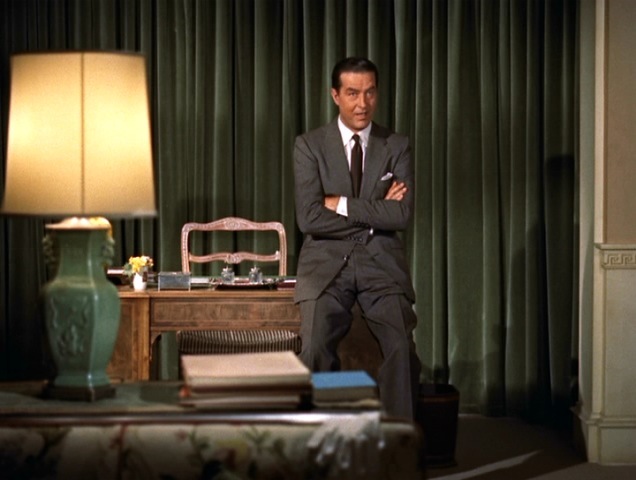 One could say that the green lamp is the “fixed point” at center stage, around which the actors turn. But it is not just the actors, but the camera as well (and therefore the viewer) that have rotated around the room. And Hitchcock is not done yet. Swan moves to join Wendice at the desk, and at this point is is clear that they have reached an agreement. Look at the perfect framing of this shot. The two men are not directly facing one another, but look at each other at a slightly oblique angle. The telephone, which is to be the instrument of murder, is dead center frame, and directly between the men. And the “new” lamp, which appears to be of Asian design as well, is now frame left. Alfred Hitchcock leaves his best camera work for the end of the sequence. All of a sudden, as Wendice begins to give the specifics of the murder to Swan, the camera cuts to a high overhead angle. I call this Hitchcock’s “God’s-eye view” shot. He employed it in a majority of his films, usually only for a matter of seconds, and usually at a moment of extremely heightened tension. (In Shadow of a Doubt, the camera pulls upward at the moment when niece Charlie discovers that her uncle’s gift of a ring came from a murdered woman. In the remake of The Man Who Knew Too Much, the camera moves overhead when the McKennas are talking to their kidnapped child on the phone.) Removing the viewer from the action in this way is startling, because unexpected. It also makes the characters, and the viewers as well, feel more helpless. Hitchcock uses this angle a little differently here. We stay in this overhead shot for two-and-a-half minutes, as we observe the plotting of a murder. So why did Hitchcock employ this high angle here? Could it be as simple as the fact that he had already shown us the room from every other conceivable angle? I think there is a very specific reason that Hitchcock saved this camera angle for the end. It serves to ensure that the viewer is aware of the layout of the room, and exactly where everything is, so that when the murder comes we know exactly what is supposed to happen. After this the camera returns to an eye-level two shot, and finally we fade to black over 22 minutes after the sequence began. The success of the film hangs on this sequence; not only is Wendice hooking Swan, but Hitchcock is hooking the audience, and the innovative camera movements, combined with the exquisite set design make this sequence wonderful, and a prime example of his masterful directorial eye. 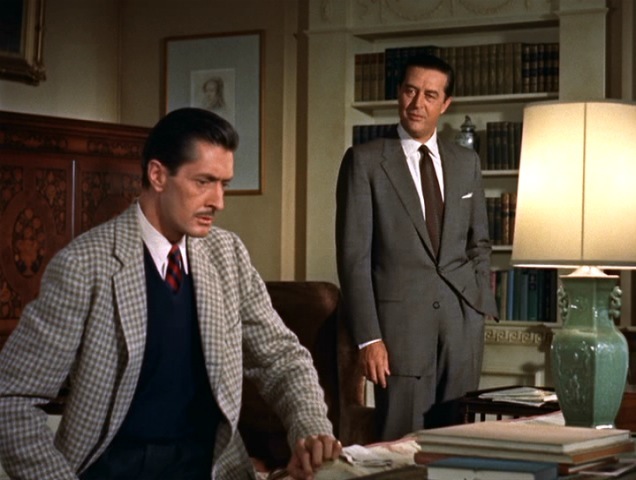 Principal cast: Ray Milland (Tony Wendice), Grace Kelly (Margot Wendice), Robert Cummings (Mark Halliday), Anthony Dawson (Lesgate/Swann), John Williams (Chief Inspector Hubbard). We open on an idyllic marriage scene, in a small but well-furnished London flat, the happy wedded couple locked in a kiss. Cut to the same married couple, eating breakfast. The wife is reading a small notice in the newspaper, about an American author due to arrive in England on the Queen Mary that day. Cut to attractive man disembarking from the Queen Mary. Cut to this attractive man, locked in a kiss with the wife, in the same London flat we just witnessed a moment ago! Alfred Hitchcock, who got his start in silent films, and never lost his flair for visual storytelling, has given us a complete set-up to the story in two minutes, with no dialogue. The wife, Margot Wendice, and the author, Mark Halliday, had a fling the previous year, when Mark was last in London, and Margot’s marriage was in turmoil. Now, Margot tells Mark, her husband Tony is a changed man. She won’t leave him, because he has become the perfect husband. She also tells Mark that she destroyed all of the letters he wrote to her, except one, which was stolen from her purse. After the theft she recieved two anonymous letters of blackmail, and even after she paid the requested sum she never recieved the letter back. At this moment Margot’s husband Tony returns to the flat, and his wife introduces Mark as a friend of hers. Tony sends the couple off for an evening on the town, saying he is too busy with work to accompany them. He then makes a phone call summoning a man to the flat, on the pretext of buying a used car. This man, named Swann, was an old college schoolmate of Tony’s, and Tony uses a very subtle and charming method of blackmail to convince Swann to murder his wife, for the sum of one thousand pounds. It turns out that Tony knew about the affair all along. He is the one who stole the letter from his wife’s handbag, and he wishes to dispense with her and inherit her considerable fortune. The murder is to take place the following evening, when Tony and Mark will be at a stag party, and Margot will be home alone. Tony will hide a key outside the flat so Swann can let himself in, then at an arranged time Tony will make a phone call to the flat, summoning Margot from bed to the phone, where Swann will finish her off. There is a very suspenseful build-up to the moment of the phone call, and as it happens Margot is able to grab a pair of scissors from the desk and stab Swann in the back. He falls to the floor, impaling himself and dying instantly. Margot summons Tony home, who, instead of despairing at seeing his plans foiled, sends Margot to bed, then rather adroitly manipulates the scene so it will appear that Margot wilfully murdered Swann. Now Chief Inspector Hubbard (played by the always solid character actor John Williams) arrives on the scene. It is established rather quickly that Margot is indeed convicted of murder and sentenced to death. It seems that Tony’s plan will succeed, but Inspector Hubbard is a very cool character, and knows more than he lets on. The climax of the plot hinges on something as simple as a key, with Hubbard playing a hunch that turns out to be correct. Why does this film work as well as it does? It is 80% dialogue, 20% action. It takes place all in one small flat. It is considered a “minor work” of Hitchcock, and justifiably so. And yet it is thoroughly entertaining. For me it is Ray Milland that saves the day. The wrong actor in the Tony Wendice role would send the film irrevocably off the rails. Performance: The performances are all solid, with the exception of Robert Cummings, who seems a little soft in his role as the boyfriend, and fails to generate any sympathy. 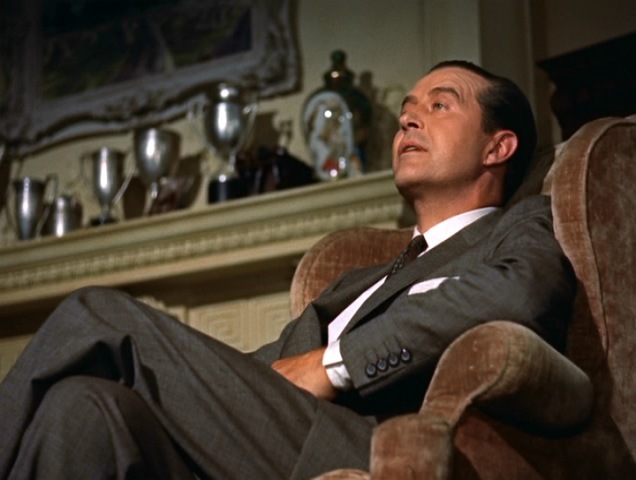 Ray Milland really carries the movie, as yet another sympathetic Hitchcock villain, charming from his first scene to his last. John Williams is fantastic as Inspector Hubbard. 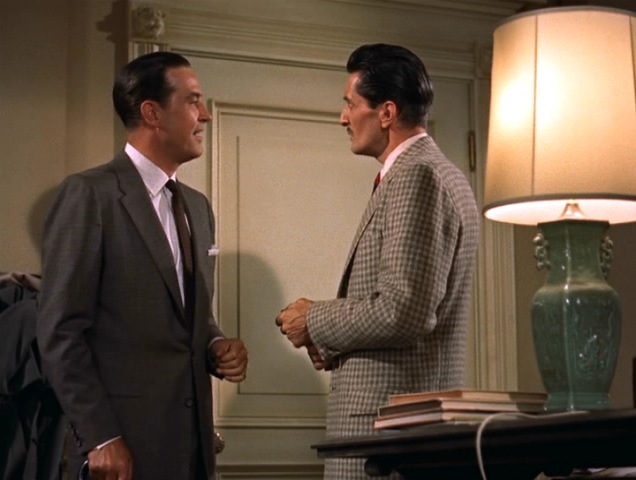 (Film lovers may recognize Williams as Audrey Hepburn’s chauffeur father in the movie Sabrina, also released in 1954.) Both John Williams and Anthony Dawson reprised their roles from the original New York stage production of the play. And then there’s Grace. Has any woman ever looked as gorgeous on screen as Grace Kelly? Although she had an other-wordly beauty, she always created characters that female moviegoers could identify with. Hitchcock in 3D? Yes, this film was initially released in the 3D format. Alfred Hitchcock did not wish to use 3D in the way it was typically employed at that time, with lots of very obvious moments of long narrow objects poking and jabbing at the audience. He only employed that twice in the film, once with scissors and once with a key. Rather, in anticipating the way 3D is used today, he framed the scene with objects along the proscenium, like a lamp, or a bottle, that gave added depth to the scene. The film has not been available to view theatrically in 3D since a brief re-release in 1982, but is just as visually compelling in the 2D format. Source material: Frederick Knott adapted the screenplay from his own successful stage play, and changed very little. All of the major plot elements are in place in the play, and many lines of dialogue are lifted directly from it as well. Keep it closed: In the Truffaut interviews, Hitchcock talked about directors adapting movies from stage plays, and how they would frequently “open up” the play, taking it beyond its original setting. He felt this was a big mistake; it was the original story and setting that made the play successful, so he felt one should not mess with success, but rather keep it in its original setting. Guilty as charged: Since the theme of guilt and innocence seems to be the most prominent throughout Hitchcock’s works, it may be worthwhile to look at how the concept applies to the characters in this film. Tony Wendice is guilty from a criminal respect; he first plots to murder his wife, then works to have her hanged for murder. Yet there are many moments in the film when the audience sympathizes with Tony. Certainly Margot and Mark are guilty of infidelity, and while this is not an act deserving of murder, it certainly colors the way that viewers feel about them as characters. Mark is never a sympathetic character. Lesgate, or Swann, is also criminally guilty. It would appear he has had the makings of a thief for many years, and he rather quickly agrees to commit a murder for a fairly small sum. Many would argue he gets what he deserves. Yet once again, Hitchcock manipulates the audience in such a way that we feel a bit sorry for Lesgate, who is really just a pawn in Tony Wendice’s grand plan. Even Inspector Hubbard carries a guilt, for he manipulates the Wendices as well, in order to prove his theories. So on a psychological level, there are no innocent people in this film. And Hitchcock, primarily through the story and brilliant cutting, has the audience shifting its sympathies almost from moment to moment. Recurring players: Robert Cummings had earlier starred (in much more convincing fashion) in Hitchcock’s Saboteur. 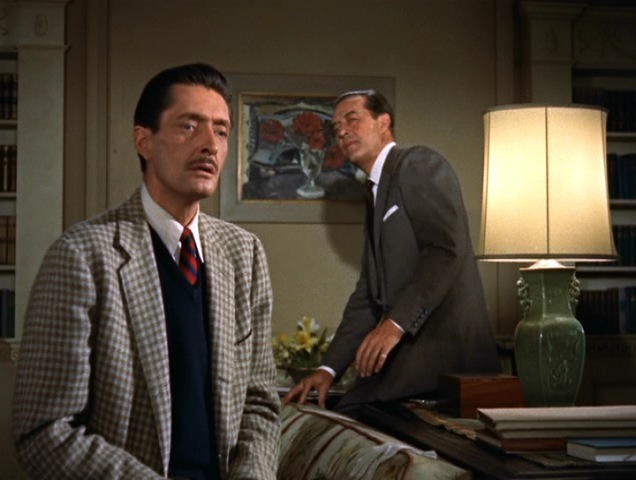 John Williams had appeared in 1947’s The Paradine Case, and would later become the go-to guy for the Alfred Hitchcock Presents television show, appearing in numerous episodes. Harold Miller was also an extra in Saboteur. Sam Harris (man in phone booth) was also an extra in Foreign Correspondent, Mr. and Mrs. Smith, Saboteur and The Paradine Case. 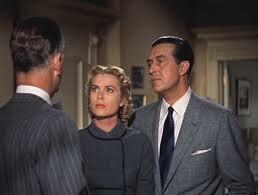 Forbes Murray, (the judge) would later appear as an extra in Vertigo. Grace Kelly would go on to star in the unforgettable Rear Window, and she would have the pleasure of sharing the screen again with John Williams in To Catch A Thief. And let’s not forget Bess Flowers, “the Queen of the Hollywood extras.” She appeared (primarily as an extra) in over 700 films, far and away the most of anyone in movie history. 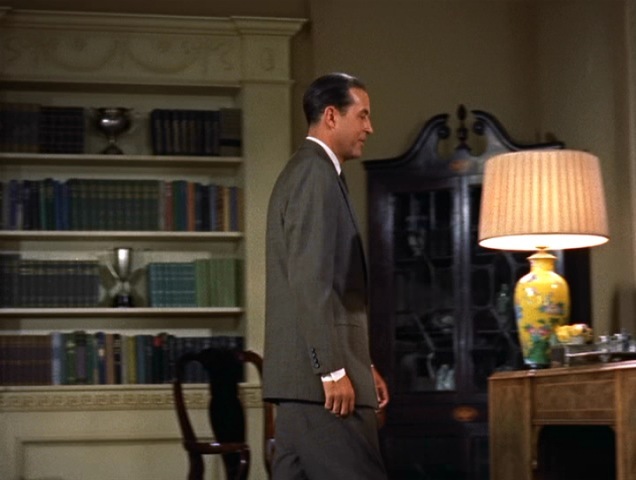 In addition to being “woman departing ship” in this movie, she was also an extra in Mr. and Mrs. Smith, Notorious, Rear Window, To Catch a Thief, The Man Who Knew Too Much (1956), Vertigo and North by Northwest. Legacy: This movie would be remade twice for television, in rather forgettable versions. It was also updated for the big screen in 1998’s A Perfect Murder, directed by Andrew Davis and starring Michael Douglas, Gwyneth Paltrow, and Viggo Mortensen. 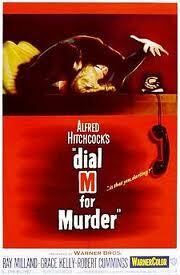 This version has the husband (Douglas) convincing his wife’s lover to commit the murder for him. It does not share too much in common with the original film, and while the plot twists are somewhat clever and original, it does not have the dramatic intensity of the earlier film. Where’s Hitch? How would Alfred Hitchcock insert a cameo into a film which takes place almost exclusively in one room, with a very small cast? No problem! 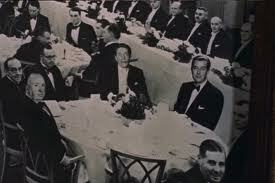 In the school reunion photo hanging on the wall, in which we see Tony Wendice and Swann sitting side-by-side, there is a familiar face on the near side of the table, turning to look at the camera. This very clever and effective cameo comes at about 13:11 into the film.